We now have a bandcamp page where you can stream the entire first album. It's located at http://crookedcolumns.bandcamp.com/ or just click play on the player below. If you dig what you hear be sure and pick up a copy of the tape from the label before they disappear. In other news, plans are in the works for some definite recording this Winter as well as hopefully some shows. Things are slow living two hours apart but we are determined to make things happen this Winter. "The execution of Crooked Columns’ Chemical Mysticism is flawless, from the multi-fold cover to the full-sounding production to the ambitious, wreathed-in-flame, dark-electronic, film-music mission of the band. Very incisive stuff that uses repetition to its advantage rather than to the listener’s eternal boredom. Not an easy thing to do. There’s a shamanic trance-out on Side 1 that might be one peyote trip to the desert short of being technically illegal in this country. It storms over the soundscape like a group of bandits overtaking a small village, dark and demanding, yet with a laser edge that continues to evoke that soundtrack-y feel, fireworks and all. And there’s a lot more where that came from; Chemical Mysticism is relentlessly, almost horrifyingly evil at times, and you’ll appreciate the extra hint of spite. Never an iota of drone complacency despite the long run-time of the tape, and yet another stellar cassette that will be plucked up and re-released on vinyl at some point, even if it means future civilizations will have to mine it from a molten core of corn syrup underneath the earth’s crust. Easily one of my favorites of the year, on any format, and still available from the label." The first review for "Chemical Mysticism" has come from Aquarius Records! You can also order a copy from them or pick up a copy in person if you're in San Francisco. Many thanks for the good words! Another choice slab of gnarled industrial dekompositions from Black Horizons! Crooked Columns is a new project to us, hailing from Portland, Oregon with handful of equally unknown ancillary projects from the various members. Searing synth tones, crushing noise concoctions, and an occasional rhythmic outburst of militaristic aplomb set the stage for a cassette that could easily be passed off as something with origins dating back to 1984 from some armpit town in sodden England or from some death-obsessed Italian miserably enduring the Mediterranean sun. Even with all of the noise and grind and toxic bloom, Crooked Columns muster some intriguing variations on their core strategies of loops and noise. Sure there's plenty of references to MB's mechanical lurchings from back in the day, but that extended track with pronounced rhythms has more of a Konstruktivists feel topped with atonal horns and plenty of scabrous blurts of noise. Warbling loops and heart-beat pulses lead into smashed amplifier destruction on the second side of the tape, with plenty of horror-score sound design vibes tossed in for good measure. Really great stuff, we have to say. And as is the case with all of the Black Horizons tapes these days, very nice packaging with gold offset printing on metallic blue paper. Careful though of the drug-sized baggie tucked away inside the J-card. Supposedly, the rusted metal has been dosed with tetanus. Don't tempt fate, please. As with all the Black Horizons tapes... LIMITED TO 100 COPIES. "Chemical Mysticism" C46 out now! Our first full-length album recorded between 2010-2012 via mail is out now! A huge thank to the Black Horizons label for doing such an amazing job with this and really doing it right. Plans are in the works for our first in person recordings now that we both live in Oregon again, as well as shows and touring in the late Summer/Fall. 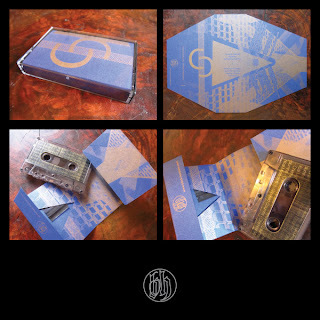 Crooked Columns - "Chemical Mysticism" C46 out now on the Black Horizons Label. "Seven tracks of rhythmic, dense, abrasive and deep post-industrial music. Hits hard at times but that is not to say that it doesn't have it's more progressive moments and a well worked over production. This duo of Andrew Quitter and Luis Gonzales will be doing a west coast tour this summer, so go check them out if you get the chance! J-card is offset printed gold ink on metallic blue stock, cut into a diamond shape and carefully folded down into a j-card. Comes with a small blackened drug baggie containing a dose of Tetanus, to get crooked. Smokey tapes with gold labels in an edition of 100." Early mix of our track "Nomadic Rupture" from the new album coming out soon. Video made by Luis with additional artwork by Levi and Jacob. Below is another track.